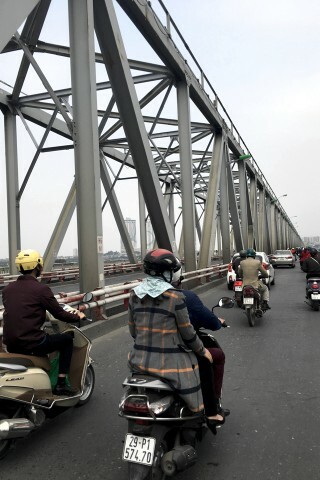 Photo: One of Hanoi's iconic Red River bridges. The Chuong Duong Bridge opened in 1985, and is one of the main bridges that moves traffic across the Red River in Hanoi. Browse places to stay in Hanoi on Agoda.com. Free cancellation. The four-lane, steel span bridge’s claim to fame is that it was the first sizeable bridge designed and built by Vietnamese workers, with no international assistance. Located just south of Long Bien Bridge, and beginning near the Old Quarter, it took almost two years to complete. Unlike Long Bien, which is worth checking out in person, you wouldn’t come out of your way to see heavily trafficked Chuong Duong, but knowing its name and position will help orientate yourself in the city. In 2014 it was estimated that about 20,000 cars and 210,000 motorbikes crossed the bridge daily.